Kids With a Hope Ministries was founded by Pastor Pablo Ureña and his family in early 2003. While working as a veterinarian, Pastor Pablo became a volunteer counselor at one of the local prisons in Santiago, and what he learned while there shocked him. While counseling multiple inmates, Pablo began hearing the same thing over and over again, and that was the fact that so many of the inmates had come from the same community. This community was something that Pablo didn’t even know existed, but this same community would soon change the entire path of his life for him and his family. Over several months of research, Pastor Pablo discovered that a very large percentage of the inmates at the prison he served at were from the garbage dump community found on the fringe of Santiago. What he found saddened and inspired him. In this community of societal outcasts, Pablo uncovered a segment of his hometown population struggling through the worst level of poverty that he had ever seen. At the local garbage dump he found hundreds of children living, working, eating and dying in the trash. The level of crime and virtual hopelessness that he discovered in this community shocked him, and in response, he felt God’s clear call on his life to start Kids With a Hope Ministries. 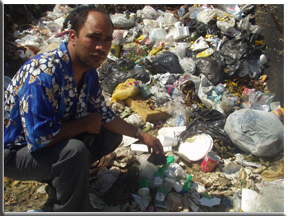 Pastor Pablo Ureña standing over medical waste found in the Santiago Trash Dump. 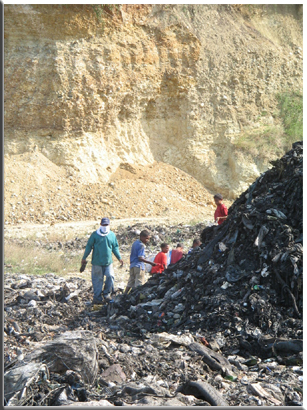 Families searching and working in the Santiago Trash Dump.